#1 New York Times bestseller Kresley Cole introduces The Dacians: Realm of Blood and Mist, a new paranormal series following the royal bloodline of Dacia, a vampire kingdom hidden within the Lore of the Immortals After Dark. 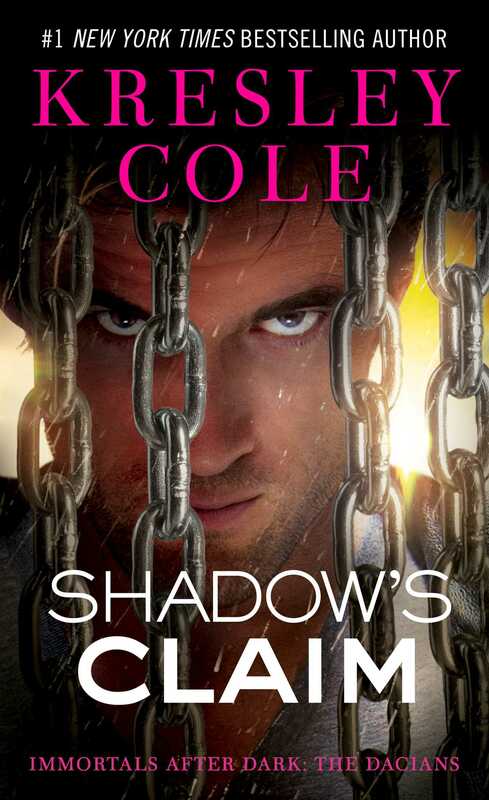 Shadow’s Claim features Prince Trehan, a ruthless master assassin who will do anything to possess Bettina, his beautiful sorceress mate, even compete for her hand in a blood-sport tournament— to the death. A savage kick to Princess Bettina of Abaddon’s back severed her spinal cord. The searing pain that had been clawing through her entire being faded below her waist to pinpoints of pressure, then tingles, then . . . Blessing. She’d long since stopped begging for her life, knew she’d never leave this field of poppies alive. The four winged monsters who’d dragged her here had plans for her: as much agony as possible before her death. Just as their kind had delivered to her sorceress mother twenty years before. Though half demon, Bettina was weak in body, hopeless at fighting. She’d depended on her Sorceri power for protection—the one that these Vrekeners had siphoned from her as easily as they’d snatched the clothes from her body. No longer could she open her swollen eyes. Her last sight? The leader standing over her, brandishing a scythe, his eyes frenzied. His claw-tipped wings had blocked the light of a low yellow moon. The scythe’s blade wasn’t fashioned out of metal, but of black flame. . . . The force of one kick jostled her over onto her belly. Her mauled face shoved against crushed poppies. The leader played with her as a hawk would a mouse, ravaging the meat from its bones. His followers jeered and doused her with bottles of spirits. Menacing yells, steel-toed boots, the blistering sting of alcohol. Ah, gods, she was too aware. She tried desperately to lose herself in memories of a boy with smiling blue eyes and sun-kissed hair. Her upper body exploded with even more pain, as if to compensate for the numbness in her fractured legs. She could perceive her broken ribs jutting from her skin. Her mangled arms draped limply across the ground where they’d fallen when she’d last tried to protect her head. . . . Anguish multiplied. Or perhaps the Vrekeners’ blows rained down more swiftly. The kill was near. Over all other pain, she perceived the heat of that burning scythe descending ever closer to her. Hotter, hotter, scorching. Alcohol on her skin, the black flame . . .
Bettina choked on a sob. They planned to burn her? Suddenly she felt weightless. This is what dying feels like? No, she was traveling. Summoned? Dear gods, yes, the demon in her had been summoned across realms. Naked, powerless, sightless, she slipped from that field in the mortal world to her home plane of Abaddon. In a flash, the poppies were replaced by cold marble, a balm on what was left of her skin. That awareness returned. I’m lying on the floor of my castle’s court, broken, wearing only my blood and the Vrekeners’ rank liquor. The courtiers still gossip and laugh. Can’t they see me? She tried to scream for help; blood bubbled up over her lips. Can’t scream, can’t move. She could only listen. A conversation between her godfather Raum—the Grand Duke of the Deathly Ones—and another was already under way. Her guardians had insisted on it, a condition of her leaving Abaddon. Bettina heard a courtier gasp. They’ve seen me. Murmurs rose to a furor. For him, she managed to slit open one eye. His curling blond hair hung over his harried face. His own eyes had gone from midnight blue to black, signaling his emotion. They even started watering as he gazed over her injuries. She saw a shining hero of old. Her beloved Cas. She tried to answer, parting her lips. . . . Her jaw must be broken. Another anguished roar. Oh, Cas. There’s nowhere else I’d rather be than with you. Bettina felt the tiniest sliver of hope, something to fight for. Surely Cas returned her feelings, saw her as more than a little sister. She hadn’t been a true demon before. Now she was no longer a true sorceress. They took my root power. My soul. A male she didn’t recognize asked, “Has she frozen into her immortality?” The physic? Free of the attack, Bettina’s body started trying to regenerate, nerves sparking to life once more. Pain erupted all over her, blistering waves of it. Even in the midst of her escalating agony and lingering horror, the words olden ways struck fear in her heart. Prince Trehan Daciano shot awake in the middle of the day, bolting upright from his pallet of furs. He gazed around in confusion, seeing his usual surroundings—shelves of books, weapons, his sideboard with carafes of mead-laced blood. Though he’d experienced no nightmare, sleep had been snatched from him, replaced by a marked unease. With each moment, he grew even more on edge, a feeling like . . . like emptiness settling in his chest. Like dread. So different from his usual numbness. Brows drawn, he rose, tracing across the spacious room to one of the curtained balconies. These grand apartments had once been the royal library. Centuries ago, he’d moved in and never moved out, haunting this place until no other member of the family would enter. Time and history seeped from these familiar stones. He knew every crag and groove as well as he knew his own grim reflection. Like these stones, I quietly endure the ages. Drawing back the thick curtain, he gazed outside. From this height, Trehan could survey far into the Realm of Blood and Mist, the secreted lands of the mighty Dacians. The royal city below was still at this hour. Only the sound of Dacia’s bubbling blood fountains could be heard. Across from his residence stood the majestic black stone castle, the heart of the realm—abandoned without a king. How many of his kinsmen had perished trying to seize that keep? How much deceit and murder surrounded it? The warring houses of the royal family had once boasted hundreds of members each—now dwindled down to a handful. For an immortal family, they knew death so well. Trehan was the last born to the House of Shadow, the assassin arm of the family. Though he was a potential contender for the crown—along with four of his lethal cousins—he had no real aspiration to seize it. A quiet loner by nature, he loathed spectacle and attention, was content to blend into the shadows. He only wanted to perform his duty. For nearly a millennium, he’d been the enforcer of law, a merciless assassin. Trehan had once foolishly entertained secret hopes, but he’d eventually embraced his father’s teachings. As was logical. I want for nothing. This was his lot, to await down here in the earth until Mother Dacia needed his sword. To strike, execute, then return. So why this unaccountable restlessness? This sudden . . . frustration? It was similar to that niggling feeling of some task forgotten. Except this feeling had teeth, gnawing at his chest. And why should Trehan have a sense of something left undone? He always did everything that was expected of him. Ever cold, ever rational Trehan couldn’t explain this. What have I left undone? Rubbing a palm over his chest, Trehan crossed to one of countless bookshelves. He selected a recently acquired explorer’s narrative, adjourning to his favorite seat before the fire, planning to lose himself in tales of life outside this mountain, of emotions he never felt, and interactions he never experienced. After rereading the same page a dozen times, he closed the tome, staring into the flames as he struggled to identify the hollow ache in his dormant heart. His fingers tightened on the book, sinking into the cover. Gods damn it, what have I left undone? Yet the dread only mounted. Then came one word, a whisper in his mind. . . .